It seems like every month when I find out what’s new in the wearable technology world there seems to be an abundance of information that’s constantly coming out. For the most part wearable technology is new, and everyone has something to say about it. The world is watching as fashion and technology dance around each other. The latest news is that wearable technology is estimated that total global shipments will meet 52 million by the end of 2014, according to wearable.com. For a long time it seemed as if the wearable technology community would never be able to live the Google Glass down. The infamous glasses resulted in the idea that all wearable technology is ugly. The Huffington Post would beg to differ; they recently curated the most stylish wearable technology trends on the market! Some of my personal favorites are the Tory Burch Fit Tracker collaboration- super trendy coming in gold, silver, and rose gold and it tracks down your steps. Pair it with any outfit and you are good to go. The Ralph Lauren Biometric shirt, it’s really one of the first clothing articles on the market that incorporate technology in the pieces. A conductive thread is woven into the shirt that measures your heart rate, stress levels, and breathing levels, which you can then plug into your smart device and viola. It’s simple and sleek and very useful. Lastly, Ringly. It’s an 18K gold ring that syncs up with your smartphone to deliver notifications that range from calendar reminders to emails! They came in a variety of colours; the onyx and emerald are my personal favorite! Manhattan recently hosted Make: Wearables Projects on the Runway at Engadget Expand, where eighteen designers came up with impressive wearable technologies. 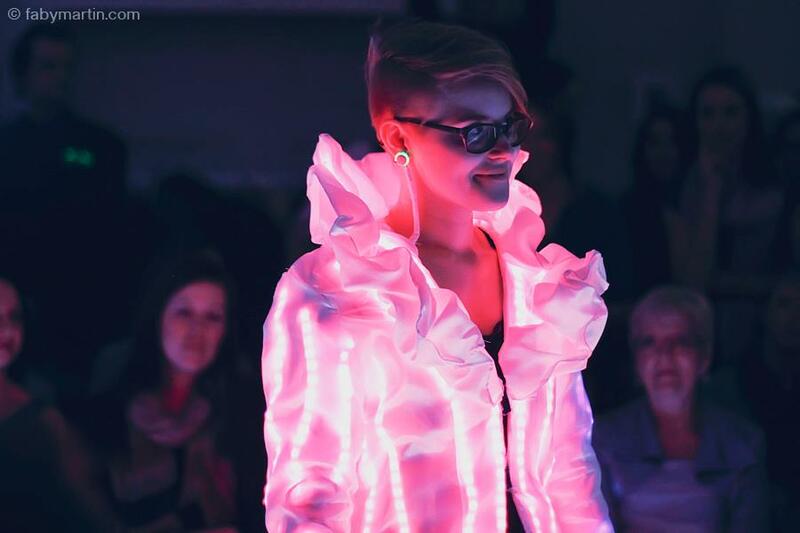 There was an array of fashionable pieces that incorporated high tech pieces like kinetics, light, 3D printing, data logging, and data visualization. As well as the incredible skill it took to think up and create each piece. The work from the eighteen designers really pushes the boundaries beyond what wearable technology is and what it could be. Now a lot of the news about fashion technology has to deal with fashion but recently there has been some interesting change that wearable technology could bring to the medical world. Intel announced the winners of its Make It Wearable contest, early last week, where wannabe gadget developers competed for more than $1 million in funding for their projects. Second place went to Bristol based start up team, Open Bionics, who came up with a fully functioning prosthetic hand using 3D printers. The hand is made up of inexpensive, lightweight materials and costs a small fraction of other mechanical hands currently in the market. With an Open Bionics’ hand, wearers will be able to grasp and manipulate objects, operate the fingers individually, and can even type on a keyboard. The hand is controlled by reading responses from the muscle movements in the wearer’s forearm. And lastly, a new form of wearable technology could help improve the communication between humans and dogs. With the help of a harness that is fitted with sensors, owners will be able to monitor both the posture and vital signs of their fur babies. This new wearable tech was designed in the US, and also contains vibrating motors so that owners can communicate with their dogs even if it’s out of sight. Which could definitely improve working with dogs. It’s been a good couple of months for wearable technology, and we’re very excited for what is happening in the wearable’s community. Be sure to check out more of the wearable’s roundups next month, and to make sure to get your ticket to the MakeCocktails event, November 22, I hear it’s going to be a very delicious night! – Article by Mary Yohannes Getaneh, a second year Journalism student at Mount Royal University and our MakeFashion intern.